Leah Hubbard, Ph.D. is a Program Director at the Translational Research Program within the Division of Cancer Treatment and Diagnosis, National Cancer Institute (NCI). Dr. Hubbard has been a member of the Translational Research Program since 2013 and manages Specialized Programs of Research Excellence (SPOREs) in head & neck, thyroid, brain, and skin cancers. Prior to her appointment as Program Director, Dr. Hubbard administratively managed gynecologic, genitourinary, breast, brain, sarcoma, and skin SPOREs. 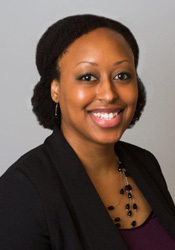 Dr. Hubbard received her Ph.D. in Immunology at the University of Michigan and continued her training at the NIH as an intramural postdoctoral fellow at the National Institute of Allergy and Infectious Diseases. Dr. Hubbard’s research training is in the area of pulmonary immunology, with specific expertise in infectious complications of bone marrow transplant, lung macrophage function and host defense, eicosanoid signaling, and syngeneic mouse modeling.